It seems a manufacturing error lead to Saubers disqualification from the Australian GP. New rules this year set a minimum radius for the rear wing elements, these were introduced to prevent slots being added to the wings to allow blown slots and F-duct stalling slots. However in post race scrutineering the Sauber fell foul of the new test, which is to uphold the revised rules; 3.10.1 and 3.10.2. The rear wing flap on both races cars was tested and its upper surface (with the logo “Sauber F1 Team”) was found to be made with too tight a radius. The new test involves checking a minimum 100mm radius is applied to all areas of the wing on contact with the external airstream. As exclusively revealed by Gocar.Gr, it appears the upper face of the rear wing flap was too curved by some 5mm. Sauber have three versions of the flap available and two were brought to Melbourne. It seems the version raced was not fully checked at the factory and therefore the error was not picked up, whereas the other (un-raced) specification flap was checked and deemed legal. Not every car and every component gets fully checked by the FIA scrutineers. The cars will go through different tests at different points in the weekend. 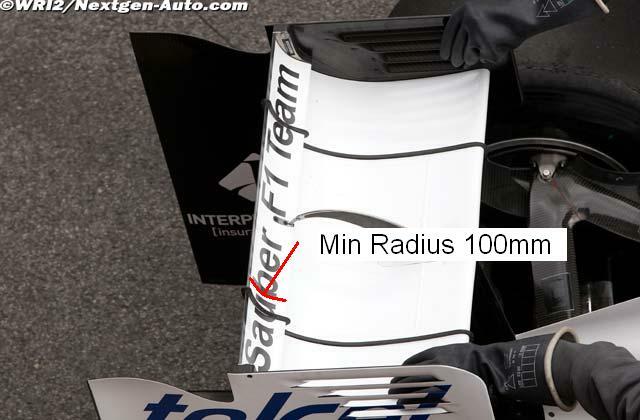 It seems the Sauber flap in question was not tested until after the race. Teams are trying to make their flaps relatively small in order to make the DRS adjustable rear wing system more effective. As a smaller flap loses more angle of attack when it pivots from its trailing edge to the maximum 50mm slot gap at its leading edge. This means the wing loses more drag as the DRS is activated, for more straight-line speed. It appears that Sauber have gone to a very tight radius flap, right on the edge of the regulations, but the manufacturing problems sent the minimum curvature over the limit of the regulations. Sauber felt this problem did not produce a performance advantage and will appeal the decision. hi craig, why were sauber excluded? compared to toyota’s 2009 rear wing infraction during quali in melbourne, this seems like very, very small potatoes. Toyota were excluded from quali. Having started at the back of the field, their wing was legal during the race. If Sauber’s problem had been discovered during quali, the same thing would have happened. The argument of whether or not it produced a performance advantage, whilst not totally convincing is a red herring. This measurement is an absolute as defined in the regulations, therefore, once it was beyond this (and outside any permitted tolerance), it has to be deemed illegal. The penalty was deemed appropriate by the stewards considering how important the wing in conjunction to the DRS is for overall speed and downforce. As to the possible performance advantage – who was quickest through the speed traps during qualifying? Also, 5mm is 5% in this case, which is quite a bit when you consider how finite the angle of attack a wing is set to. Methinks they need to swallow this, accept their inspection system didn’t work and improve their processes. i don’t think anyone is arguing that to the letter of the regs sauber’s rear wing was legal. it’s whether the punishment fits the crime as it were. i mentioned toyota’s 2009 rear wing because they were simply moved to the back of the field for the race since their infraction was caught after quali. would they have the been excluded from the race had their infraction been caught post-race? then there’s the matter of ferrari’s floor in 2007 also in melbourne… the issue is really the quality of the stewards and their interpretation of the regs imho. re: sauber being fastest in the speed trap, there’s no way to know if sauber’s approach is to maximize a low downforce setup or not after one race. it’s too early to draw that conclusion. I wasn’t saying that I necessarily agreed with the Stewards decision, but as you piont out with the Toyota incident, that was in qualy when the Stewards have the option of making a change to grid positions. It was probably difficult for them once it had been established it was illegal, not to disqualify as if they had done anything else, other teams (or the FIA) could have appealed the punishment as they would have been affected. For the record, I really feel for both Kamui & Sergio. Both drove fantastic races, Sergio in particular on debut with only one tyre change. But, such are the rules in F1, with the stakes being so high, such errors have significant consequences. Yes I noticed Mclaren had a much bigger flap. Can you explain the reason why they would do this??? Hate to agree with mister p. Fundamentally as I’m mexican, but he’s entirely spot on. Rules are there for a reason. In a sport such as this, 1mm is too much. Surely a larger radius on the leading flap surface flattens the flap and is therefore opens a larger slot and is thus more effective in stalling the wing. With a smaller radius the flap dimension top to bottom is smaller and needs to rotate through a greater angle in opening to achieve full opening. Though the smaller radius may be more effective in downforce production when the flap is shut. Did the scruntineers check this element of the car on all cars? Do we know that all the other teams have wings that comply? From what I am reading it kind of sounds that scruntineers are free to randomly check whatever part of any car, and not necessarily the same part on all the cars. Yes, they do a random checks, you can see Joe Bawer’s reports at FIA’s site, there’s a PDF, where he states which cars have been checked for what exactly. It’s a gamble, but I do not think that any team would risk DQ with illegal elements, or at least on purpose. I agree the rules are the rules. People comment on the fact referring to other years, but it is basically this year that counts. Problem is this is the first race, so there is no reference in this season. In my personal opinion, the punishment seems harsh IF AND ONLY IF there is no performance gain. Such oversights should not happen in F1, especially if there is no misinterpretation of the rules possible. However, other rules were broken (overtaking manoeuvres with 4 wheels off the track) and not even considered. Is it possible that as a result of the appeal the team remains stripped of its points but the drivers do get points? Could you explain how Mercedes does the housing of the wing mechanism thru the endplates?